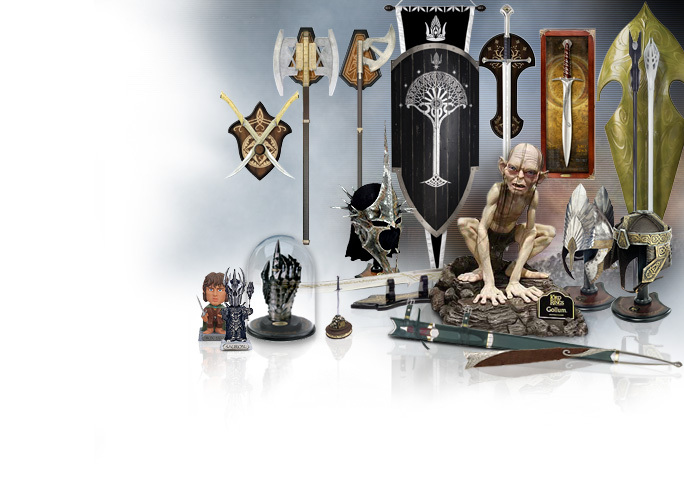 • Blades & Scabbards: All the current licensed prop replica swords & scabbards of the Lord of the Rings and Hobbit heros and villains. • Weapons & Staffs: Bows, Arrows, Maces, Pole Arms, Wizard Staffs and more elegant and rugged arms to fill your armoury! • Helms & Extras: A variety of rare and hard to find factory sealed LOTR Helmets still in our inventory. Get yours before they're gone! • Fun Gifts: Statues, Bobbleheads, letter openers, and more fun stuff.